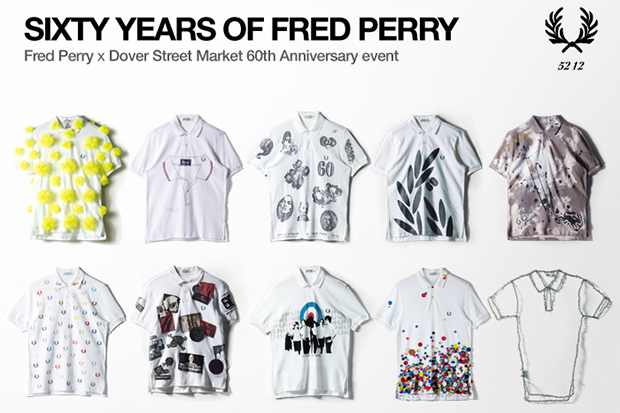 Celebrating the brands 60th Anniversary, Fred Perry have hooked up with London’s Dover Street Market to present an installation of customised shirts. For the event, Fred Perry have gathered together a group of 60 of their most distinguished fans and asked each to customise a reproduction of the original 1952 Fred Perry shirt. The first 25 customisations will go on display at DSM from January 26th as part of a special 60th Anniversary installation by Andy Hillman. Contributors to the project include Bradley Wiggins, Damon Albarn, Raf Simons, BEAMS, Medicom, Colette, Wood Wood and Stussy, all of which will be auctioned off later in the year, with proceeds going to the Amy Winehouse Foundation. You can view them all at Fred Perry now – Christopher Raeburn’s job is particularly special. In addition to the customisations, a limited collection of special edition shirts by British designers Simone Rocha, Christopher Raeburn and JW Anderson will be for sale at the store, with just 10 from each designer available. The event begins at Dover Street Market this Saturday, January 26th.